Eastern sophomore Kylie Gheen (3) spikes the ball over Lady Falcons Hannah Billups (11) and Logan Eades (14), during the Lady Eagles’ victory on Monday in Mason, W.Va.
Wahama sophomore Emma Gibbs (7) slams a spike over Eastern’s Haley Burton, during the Lady Falcons’ straight games loss to Eastern on Monday in Mason, W.Va.
MASON, W.Va — A six-point run per game kept the Lady Eagles in the win column. 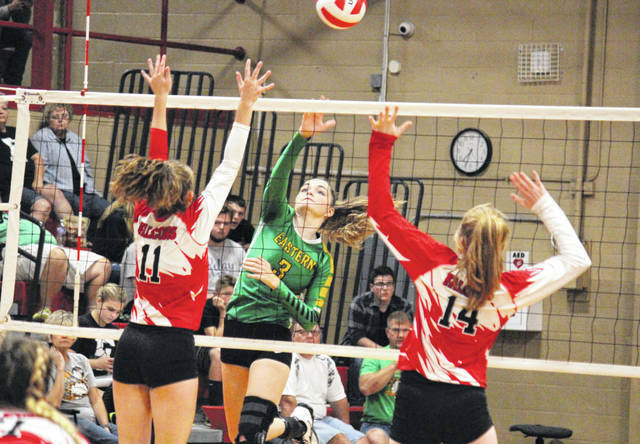 The Eastern volleyball team claimed a straight games sweep of Tri-Valley Conference Hocking Division host Wahama on Monday in Mason County, with the Lady Eagles scoring at least six points in a row in each of the three games. Wahama (1-5, 1-5 TVC Hocking) scored the first four points of the first game, but Eastern (6-1, 5-0) battled back to take the advantage at 7-6. The Lady Falcons regained the edge at 10-9 and stretched the lead to as many as five points, at 17-12. However, the Lady Eagles scored eight of the next nine points and held a 20-18 advantage. WHS trimmed the lead to one point on two occasions, but Eastern ended the 25-20 victory with a 4-0 run. Eastern led initially in in the second game, and the Lady Falcons tied it six times before taking their first lead at 12-11. WHS added one to its lead, but allowed the Lady Eagles to score the next six points. Wahama cut its deficit to two points, at 17-15, but the guests finished the 25-16 triumph with an 8-1 run. In the third game, Wahama took its first lead at 3-2, but surrendered the advantage back to Eastern at 5-4. The Lady Falcons were back in front at 10-9, before the Lady Eagles claimed seven straight points. WHS fought back to within four points, but Eastern ultimately sealed the match with a 25-20 win. Following the victory, first-year EHS head coach Mykala Sheppard was pleased with the Lady Eagles determination, but acknowledged there are still areas of that the team needs to clean up. For the Lady Falcons and ninth-year head coach Matt VanMeter, competing with the Lady Eagles for the entire match was a sign of good things to come. “It’s the closest we’ve been for three entire sets with Eastern,” VanMeter said. “Although its a victory in some ways, if you take away some of our silly mistakes, we gave them a lot of points from silly mistakes, we’d have those points back and we could beat them. The Lady Eagles finished with a serve percentage of 87.7, to go with 13 aces, while Wahama had a 91.2 serve percentage with 10 aces. Eastern held a 54.4-to-41.1 advantage in side-out percentage, a 48-to-46 edge in digs, and a 30-to-19 advantage in kills, with WHS earning a 4-to-1 edge in blocks. 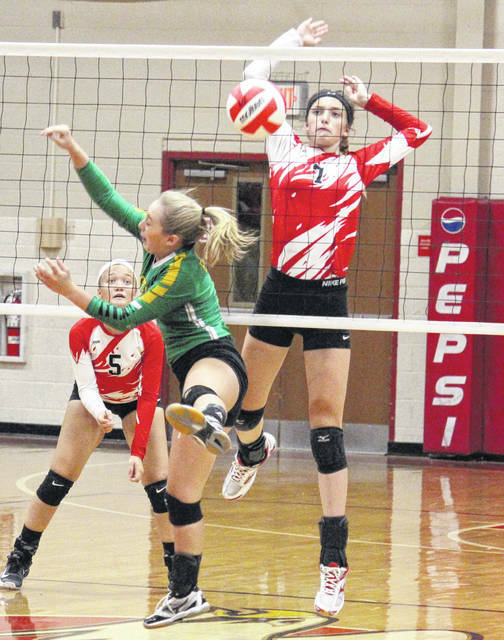 Alexus Metheney led the Lady Eagles with 10 service points, including a trio of aces. Caterina Miecchi and Jenna Chadwell earned eight points apiece, with five aces by Miecchi and one by Chadwell. Allison Barber finished with seven points and two aces in the win, Haley Burton had four points and one ace, while Kelsey Casto had three points and an ace. Layna Catlett and Kylie Gheen rounded out the EHS service attack with two points and one point respectively. 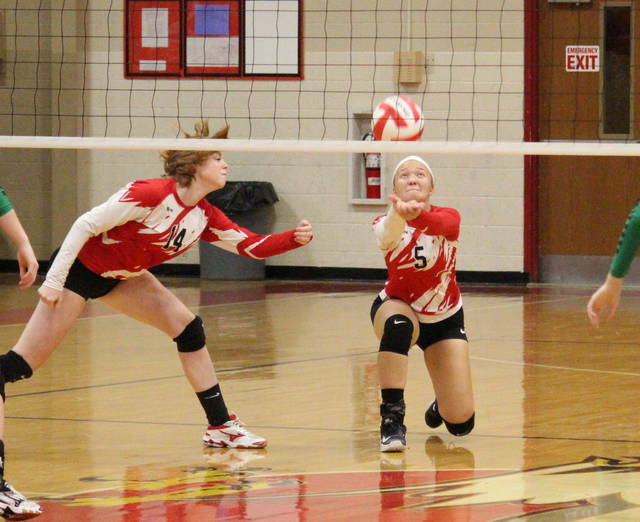 Hannah Billups paced the Lady Falcons with 10 service points and four aces. Gracie VanMeter was next with seven points and two aces, followed by Logan Eades with five points and two aces. Harley Roush had two points in the setback, while Alexis Mick and Emma Gibbs each had one, with an ace by Mick. At the net, Miecchi led Eastern with a match-best nine kills. Allison Barber contributed seven kills and a block to the winning cause, while Catlett and Olivia Barber each added five kills. Chadwell collected three kills and a match-high 19 assists, while Gheen chipped in with one kill. Allison Barber led the EHS defense with 10 digs. Billups — who led the WHS defense with 15 digs — also posted a team-high five kills for the hosts. Eades picked up four kills for the Red and White, while Gibbs and VanMeter each had three kills, with Gibbs earning a match-best three blocks. 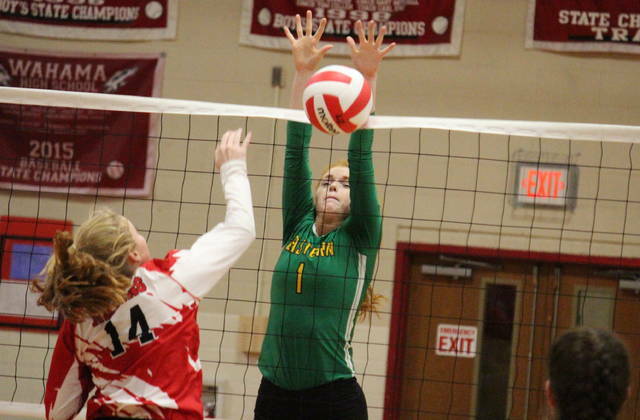 Mick and Roush each had two kills for Wahama, with Roush earning a block. VanMeter and Roush tied for a team-high with five assists apiece. After hosting Southern on Tuesday, Wahama is slated to be back on the road Thursday at Miller. The Lady Eagles also returned to action on Tuesday, as the visited Trimble. Eastern will be back at ‘The Nest’ to face defending league champion Waterford on Thursday. Wahama and Eastern will meet again on Oct. 8 in Meigs County.